I love it when creatives collaborate, the results are often fabulous! Take for instance the work of Little Owl (Bruce Wayland and Marcello De Simone) and Swarm (Leslie Oschmann). Perfect. 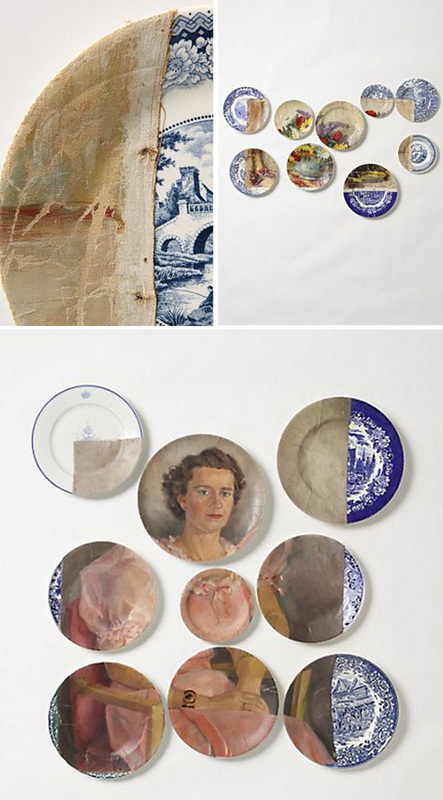 These paintings on plates are so intriguing and unique and are part of the Altered Perspective series. I don't recall seeing anything like them before which is exciting and why I find Leslie, in particular, so talented -- she really creates. "Taking two usually separate objects [Paintings & Blue and White Transferware] each containing scenes, or ‘perspectives’, and through artful alteration produced unexpected new images from the combination of both. The juxtaposition results in something that becomes a conversation piece as the canvas of the painting merges with the printed images of the plates. A landscape painted in the Netherlands blends into an English country scene on the plate, and in the process a new image is made through the merging of both. The roughness of canvas from the paintings and the smooth gloss of the plates makes for an appealing contrast of surfaces." - Little Owl. A new batch of one-of-a-kind plates just released, visit this page to see what is available. Quickly! They sell out fast!